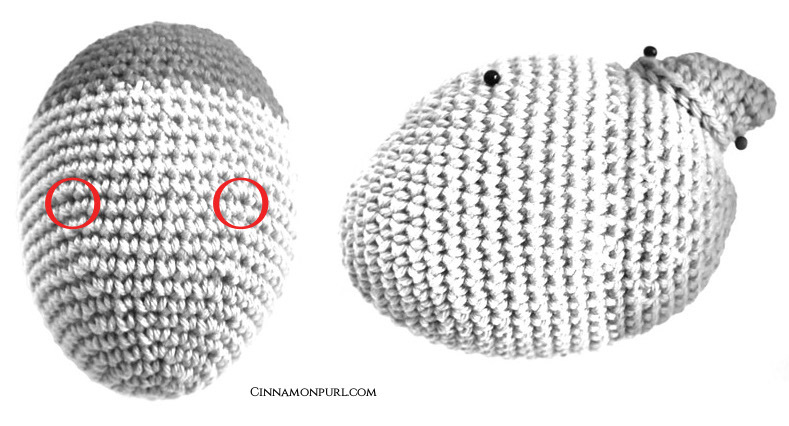 please keep in mind that amigurumi are worked in the round: so never join a round when done. I normally don’t give a stitch count at the end of a round – the stitches should always make up, if you are short on stitches or would need to make more than you have left please check your stitches, maybe even the row below. have a look at your fish’s body, do you see the last increase area at the top that goes “m2, sc8, m2” ? this will help you mark the middle / top side of your doll. Now use pins to fix the dorsal fin in place, behind the color change line. left: Red circles mark row 13, which includes: (m2, sc8, m2) These two increases mark the spots above both eyes. right: Front pin marks one increase as pictured on the left. Place the dorsal fin centered between both increases and fix it at the behind of the fish’s body before you sew it to the body. 5. sc5, row not finished! BO securely and hide yarn ends in fish’s body. Place the dark spots in the middle of the white circles and sew them both together. Place eyes below formerly marked increases (see pictures above) or where you like them best and sew them to body. BO securely and hide yarn ends in Chubby’s body. I have two kids. One is five and another is three. 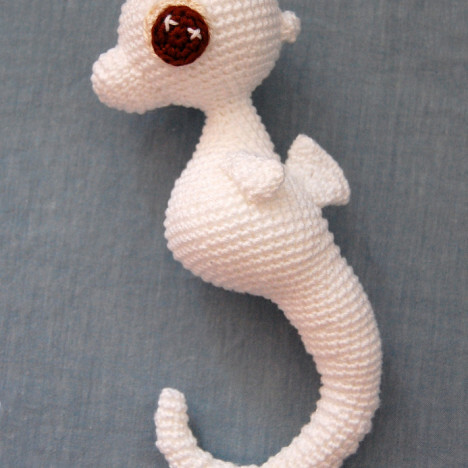 I plan to get the fish pattern for the younger one. A very sweet gift for the cute one. Hello, I’m trying to make the chubby fish but I get stuck on the Dorsal fin, second row: “start in 2nd chain from hook: sc6, m3 into last chain, turn, sc6” I simply just don’t get it. Which is the last chain? 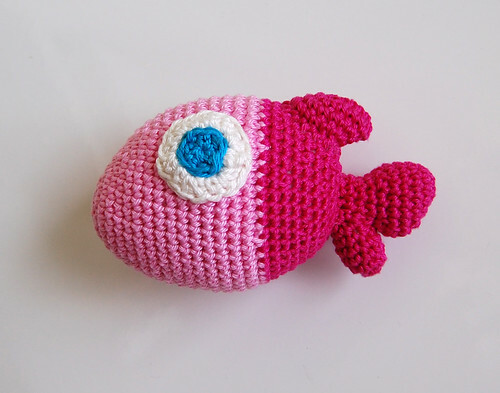 Thanks for Chubby Fish, following your pattern I made mine. I post in my blog a photo and your pattern. so nice..a have done do this..
Nice chubby fish..I like it..Trying hard to make it..haha..
And I link this site to my blog. Your work is absolutely wonderful. Thanks for the patterns and the inspiration.